Gene Vincent was a key figure in the history of rock ‘n’ roll, if only for his iconic landmark hit in 1956 with the self-penned “Be-Bop-A-Lula”, which remains one of the great rockabilly records of its time. It has become one of the most recorded rock ‘n’ roll songs of all, and has been a standard in the repertoire of bands all over the world ever since. Performing with his band The Blue Caps, his moody image of a leather-clad bad boy with distinctive quiffed hair, the mystique heightened by walking with a pronounced limp – the result of a motor-cycle accident in 1955 – made him a popular figure in rock ‘n’ roll films and tours on both sides of the Atlantic, and he was at least as popular in the UK as the USA, influencing as he did not only rockers like Cliff Richard and Johnny Kidd, but also The Beatles. 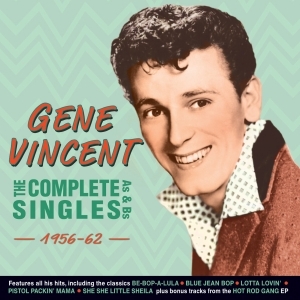 This great-value 56-track 2-CD set comprises all his US and UK A and B sides released during the period, and naturally features every hit he enjoyed during his career, including “Be-Bop-A Lula”, “Race With The Devil”, “Blue Jean Bop”, “Lotta Lovin’”, “Dance To The Bop”, “Pistol Packin’ Mama” and “She She Little Sheila”. It’s a thorough overview of his core recording career and an enjoyable showcase for his distinctive talent.